Vampire death dealer Selene fights to end the eternal war between the Lycan clan and the Vampire faction that betrayed her. From the release of the first film in 2003 to the fourth chapter in 2012, we got a new Underworld movie every three years. However, fans had to wait five years for the fifth film, 2017’s Underworld: Blood Wars. Given that Blood Wars became the lowest-grossing entry in the series, I wonder if it may end the franchise. Apparently filmmaker Len Weisman already announced a sixth film, but with a worldwide gross of barely $80 million, Blood Wars didn’t set sequel-loving hearts aflutter. I saw the first and fourth Underworld films, neither of which did a lot for me. Hope springs eternal, though – the franchise always showed promise, so I thought perhaps Blood Wars might finally give me an Underworld adventure that I could embrace. As depicted in prior films, vampires and werewolves – called “Lycans” here - remain locked in a literal eternal struggle. The Lycans near the defeat of their ancient foes, and their leader Marius (Tobias Menzies) believes he can finish them off if he can use the powers of a Vampire/Lycan hybrid named Eve. The kicker: Eve is the daughter of noted Vampire “death dealer” Selene (Kate Beckinsale), someone who feels betrayed by both sides of the struggle. Selene does her part to attempt to end the war. As noted, we may get a sixth Underworld, a fact that tells you Selene probably doesn’t succeed. Underworld: Selene Drinks Mai-Tais on the Beach seems like a bad idea for a movie, especially with that pale Vampire skin of hers. Frankly, I’m astonished the Underworld franchise has lasted this long. None of the first four films did great box office, and as I mentioned earlier, Blood Wars failed to reverse this trend. Perhaps the movies sell enough on home video to justify their expansion, but their big screen sales never seemed impressive. Which makes sense given the lackluster quality of the films themselves. Like I indicated, my prior experiences with the series failed to do much for me, and Blood Wars didn’t change that stance. I watched Blood Wars right after I viewed the original Underworld for the first time in years, and I will say this: the franchise boasts a high level of consistency. I would expect some stylistic or cinematic changes over the 14 years and handful of movies since the 2003 debut, but Blood Wars matches the tone and feel of the original surprisingly well. I might credit this as a greater success if I liked the first movie more, but given my lack of enthusiasm for Underworld - or Awakening - I can’t express much delight in the consistency. Back in 2003, I believed that the “werewolves vs. vampires” concept offered the potential for drama and excitement, and I still think that, but Blood Wars continues to fail to explore the themes in a satisfying manner. That means a storyline that doesn’t go anywhere. While the Underworld universe aspires to grandiose, epic dimensions, the result always feels bland and tentative. No matter how seriously everyone involved seems to take the material, Blood Wars never threatens to deliver interesting characters or compelling situations. And boy, do all the participants treat the subject matter seriously! I guess I respect the commitment to the material, as I prefer a straight approach to one in which those involved wink at the camera, but I can’t help but wish Blood Wars offered the occasional sense of lightness or levity. It doesn’t, as instead, the movie remains persistently dour and dull. We never invest in the characters or their development, and the action seems bland at best. No matter how hard the filmmakers attempt to gussy up the fights, they feel half-hearted and perfunctory. 14 years into the franchise, one might hope that the visual effects would show improvements, but if anything, they’ve regressed. I’d blame this on budgetary restrictions, but the original Underworld only cost $22 million in 2003, so the $35 million for Blood Wars in 2017 seems comparable. Wherever the blame lies, the effects remain poor. Various supernatural creatures look cartoony and take us out of the movie whenever they appear. Or they would distract us from the narrative if we cared about the story in the first place. But we don’t, as Blood Wars offers an overwrought, sluggish enterprise with little charm or excitement on display. 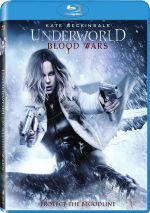 Underworld: Blood Wars appears in an aspect ratio of approximately 2.40:1 on this Blu-ray Disc. No issues developed in this pleasing presentation. The prior Underworld films focused on a heavy blue tint, and that continued to be the case with this one. Within those parameters, the hues looked appropriate. Blacks were dark and tight, while shadows showed good clarity. Overall, this was a positive image that deserved a “B+”. As for the DTS-HD MA 5.1 soundtrack of Blood Wars, it seemed positive, though not quite as ambitious as prior films. This meant that the soundscape opened up pretty well for its action scenes, but I thought it felt less active than in the past. Nonetheless, the mix offered a nice array of fight sequences, and those managed to expand the horizons in a compelling manner, as various elements meshed well and filled the room. Music showed good presence as well, so this turned into a very good soundscape. Audio quality remained strong, with speech that sounded concise and distinctive. Music showed nice range and heft, while effects appeared accurate and full, with deep bass response. The soundtrack brought a good sense of sizzle to the proceedings. A handful of featurettes appear, and we open with The Evolution of Selene. It runs eight minutes, nine seconds and offers comments from producers Tom Rosenberg, Richard Wright and Gary Lucchesi, director Anna Foerster, and actors Kate Beckinsale, Theo James, Charles Dance, Clementine Nicholson, and Daisy Head. We get notes about the development of Selene across five movies as well as aspects of Beckinsale’s performances. Not much information appears in this largely superficial overview. During the six-minute, 15-second Old and New Blood, we hear from Wright, Lucchesi, Foerster, James, Nicholson, Dance, and actor Peter Andersson. “Blood” looks at returning and new characters as well as the actors who play them. Like “Evolution”, the featurette lacks much informational value. The Evil Evolved goes for six minutes, seven seconds and features Head, Foerster, Wright, and actors Lara Pulver, Bradley James, Tobias Menzies and James Faulkner. This one continues the trend of its predecessors, as it looks at more supporting characters/actors. It also fails to deliver much of merit. Lastly, Building a Blood War fills 12 minutes, three second with info from Foerster, Lucchesi, Rosenberg, Wright, Beckinsale, Pulver, Nicholson, Andersson, executive producer/VFX supervisor James McQuaide, production designer Ondrej Nekvasil, and costume designer Bojana Nikitovic. “War” looks at Foerster’s impact on the production, visual effects, locations and set design, and costumes. “War” offers the most informative of the featurettes, as it gives us some good notes about production areas. We also find a graphic novel rendition of Blood War. This uses a still frame format to show the comic book in question. It offers an interesting take on the material and is worth a look. The disc opens with ads for Spider-Man: Homecoming, Resident Evil: The Final Chapter, Trainspotting 2, Resident Evil: Vendetta and Life. No trailer for Blood Wars appears here. Five films into the franchise, Underworld: Blood Wars offers the same old, same old. The movie offers little in the way of thrills or drama, as it plods along without much forward momentum. The Blu-ray presents very good picture and audio as well as a smattering of minor supplements. Blood Wars offers a forgettable affair.